You want to send an I Love You Quote / Message for your girlfriend. But don’t know how? Don’t panic. 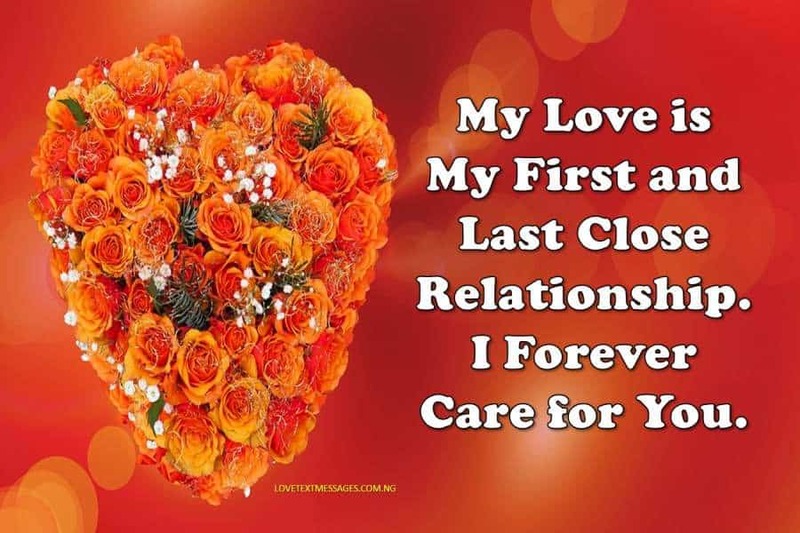 Below are most sweetest and most romantic I Love you Quotes and Messages/ SMS For Her that you can send to your girlfriend to make her happy. Having a lover is so great. 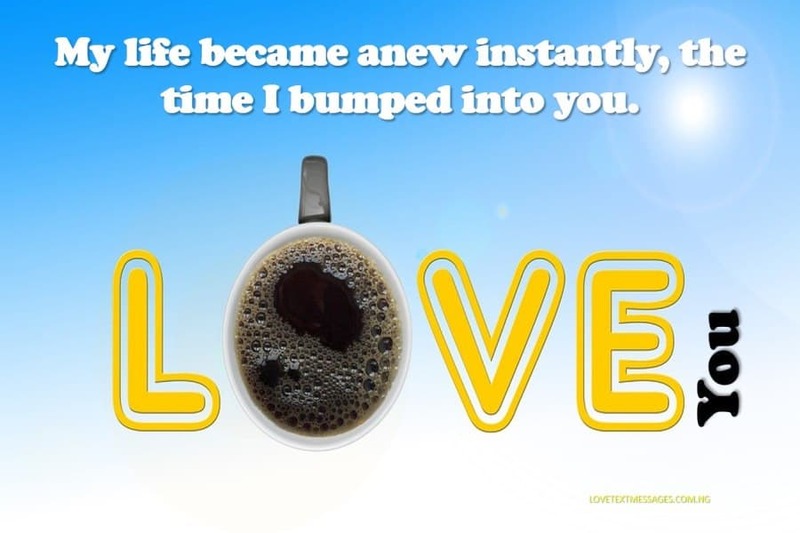 Express your feelings towards your lover with these Lovely I Love You Quotes and Sayings. 1. My angel, you are my most important treasure. I can’t live okay without you. 2. I wish that I am a poet that can actually write perfect, lovely and romantic love quotes. But, I am not. Anyways I am still yours. 3. This message can’t be romantic as you want, I need you to know that I am always here to satiate your utmost cravings. 4. My desire is like yours, the more you show the more I express even beyond your efforts. Baby. 5. I wish I have all the best things of life. I will have given you the most treasured for free. 6. You are mine, just like a fish is to a sea. I can’t breathe air without feeling happy when I’m in your presence. 7. My heart, I can’t really feel chuffed without your love. You know that? 8. For all that you have tried your best to be like, I hope you find it. 9. 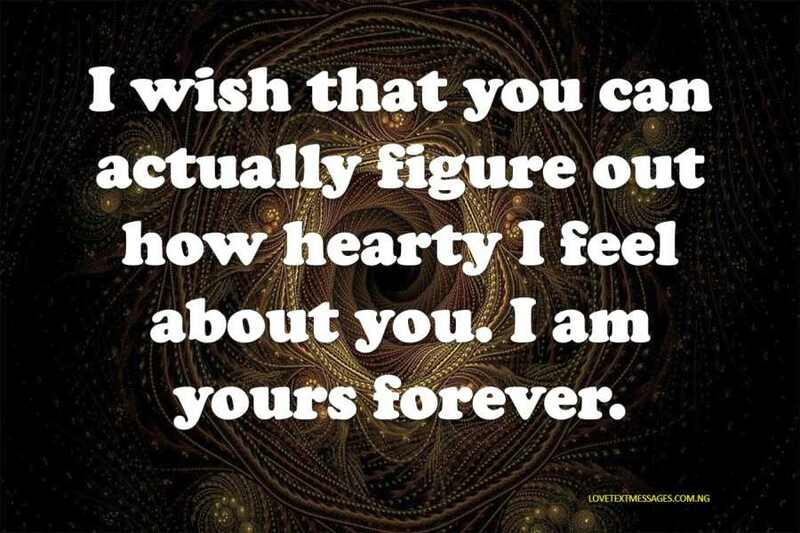 I wish that you can actually figure out how hearty I feel about you. I am yours forever, girl. 10. For what you are, the place you are, where you will be and how you will be. I am yours still, without any reservations. These are the Best Romantic Sweet I Love You Quotes you can send to your lover, to tell her how much you love her. 11. You know that feeling that makes a guy say he is a Romeo? That’s exactly how I feel daily for you. 12. My heart was a once-broken city that got mended by you. I heart you, dear. 13. My life became anew instantly, the time I bumped into you. I love you so much. 14. Your love is the action of what the verb really means. Did you know? 15. If there is a person out of the worlds million numbers, I can’t live without, then it’s you. If not who? 16. If dying is what I will do in my next moment, then, fine. But, let me have a feeling that you are mine. 17. Your presence evokes happiness, from your dimples, smile, voice, humility and all. You are distinct. 18. There is a drum that beats constantly. For your heart’s palm taps it. And do you know your smile alone is enough to make me feel fulfilled? 19. If rest is meant for one who works. Fine. But, an angel like you should be resting too. Yea. 20. My world is beautiful because you adorn its looks as the rainbow. Yes, you, my love. Saying I love you to the person you love sincerely is not a crime and if it is a crime you should be ready to be on a wanted list with these perfectly constructed I Love You Quotes for Lover. 21. I need the lips of our silence to part and paint how deep our feelings are in love. 22. Despite the harsh conditions we experienced, we have been together. Because you are a diamond that no sage will let go. 23. I see you as the rays of sunlight. For you are distinct. 24. My days are filled up with bliss and nought, just because of you. 25. What’s life, without your presence, blossom, and the smile that happens just because of me? 26. Other girls could do me a favor. But yours has always been way better than theirs. I love you. 27. My life is one of the best because of you if at all there is really another life helper that outweighs you. 28. My wench, my friend, my all. I love you, dear. 29. Life taste sour without you, my love. I mean my words dear. 30. My rainbow, do you know that you always gleam and make my world an art? I love you. You have a lady in your life that you can not but think about her? The best thing you can do is sending her these I Love You Quotes for Girlfriend to convey your thought towards her. 31. I love you not because you are rich or but, your faithfulness and sacrifice. I really love you, dear. 32. Life is nothing, but a pile of chaff – without you my girl. 33. I can’t discard the feeling that you spice up my life than an egg-sauce to a boiled yam. Lol. 34. Living without you by me is a big reason why I always feel homesick. Can you send me some smiling selfies of you? 35. I wanted to send you some love messages and quotes. But, you know I am not a writer. Anyways, you are the balm that soothes my throes. 36. My best half. I can’t imagine living a fulfilled life without you by my side. Any day. 37. I will give my all, just to make you feel chuffed always, my girl. 38. Others may look glamorous, but I will still choose you with all your imperfections. 39. I wish that these words have gestures so that I will make them show actually how happy I feel about you. 40. My gadgets may crash or ware. But you will never fail to keep your words. Feeling unexpressed can be so painful. Take a giant step today by expressing your love to your girlfriend by sending her these Romantic I Love Sms and Quotes. 41. My heart throbs with beats of our love. I can’t live without you, girl. 42. Every day begins with a smile that I subconsciously find me doing and it’s all because of you. 43. I need you to know that you are more than this phrase; “close friend”. 44. The two gleaming natural bodies; sun and moon may shine. But you mean more than that to me. 45. My yes reliance, yes, you! I love you from my heart’s depth. 46. I have always longed for the day that you will say you are mine and you have just said that. I love you. 47. I feel complete way more than a superman. By just hearing you say; you are my love”. 48. Even when I am lonely. My heart’s ears still listen to the music your love plays for me. 49. Waking beside your presence is enough to make me know that I should be happy about life. 50. I love you, even more, when you don’t say you love me but stare at my eyes in a comely way. Expressing your love to your lover by saying just “I Love You” is always followed up by a strong emotional attachment. Why not input strong emotions into your relationship by sending her these Awesome I Love You Quotes for Girlfriend. 51. Your love is a spice that everyone will crave to have. I can’t do without your affection. 52. For your small embrace, your care and all. My heart loves you strongly. 53. If only you will put my love in your heart’s crust. My life will be void of misery. 54. Life had been full of horrifying stories till I met you sometimes ago. 55. My life became a blissful tale at last after we crossed each others path. I care. 56. I always pray for the one who knows why I wrote these words. And that’s you. 57. My love, you are my best chum. I hate to know that I was overlooking your presence in my life. 58. I wish that moment you said you love me is still on repeat, girl! 59. You know what? You are my ever gleaming sun. Not the sky’s, I mean it. 60. I love you with an ever-burning desire forever. 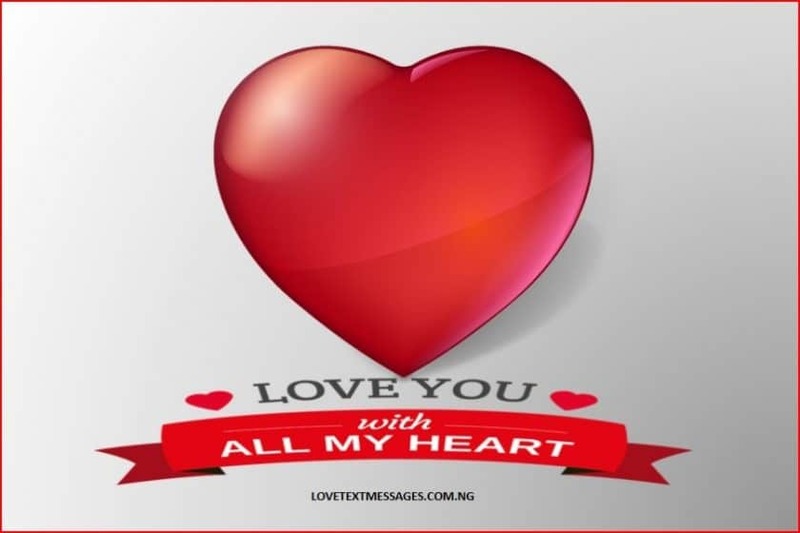 The Best Messages you can send to your lover, to express your love for her is I Love You quotes and Messages for Her. Give it it a trial and you will share the testimony. 61. Till time ceases to exist, I can’t live you. Never. 62. I wish that my heart is openable so that you can have a glimpse of how I care for you. 63. That feeling that one never minds doing anything awful to please another, is such that I have for you. 64. If I have the power to do wonders, I will fly us up to the sky and build us a beautiful castle. 65. Love is made up of joyful times, affection and pleasure. I am happy that I get to spend all those moments loving you every day. 66. I am the one whose mind, will not mind going gaga just for you. 67. I don’t mind what people say, think or write against me. I am already crushing on you. 68. If love, as they think, is but a mere feeling, mine is not ephemeral as it seems. I love you. 69. I am always smiling and laughing even when things go amiss. Because I have you. 70. You said you care and I want to let you know that I more than care for you. 71. Your love is a comely spice that I can’t live without. The most interesting thing to say in a relationship is I Love You. Fulfill your own part of strengthen your relationship with that lovely girlfriend of yours by sending her these Latest I Love You Quotes as text Messages. 72. My love is my first and last close relationship. I forever care for you. 73. Finding your affection is one that I will never want to lose, it is an amazing thing that has ever happened to me. 74. Whenever soul mates meet. They try their best to stay glued to one another like a thread and needle. 75. Like a flower does to a bee, so does your love makes me feel. 76. You are indeed a miraculous blessing. I can’t really feel okay without your love. 77. We may tend to be fighting sometimes, but you are always a friend and will be, forever. 78. Friends are always together, but great and genuine friends are like two papers mated with a strong glue. 79. My life is now in a halcyon moment. I feel so chuffed about it than before, just because of you. 80. 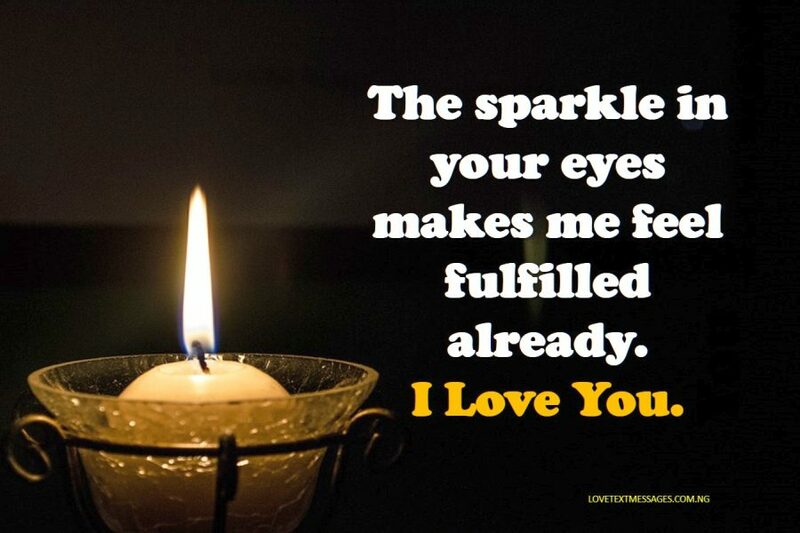 The sparkle in your eyes makes me feel fulfilled already. I am telling you! 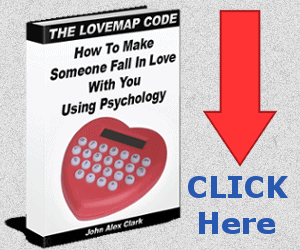 Inspire your relationship with these Inspirational I Love You Quotes for Her and watch as it strengthens the bond between you both. 81. Your eyes’ comeliness is like a wand that makes me wonder if there is a thing in life that will make me stop loving you. 82. I can’t breathe air without wanting to feel yours mixing with mine. 83. My wife, love and closest chum. You are my everything. 84. You make my shoulder raise high knowing that you are mine. Lol. 85. You always make me gently lose my mind over you. 86. Even when you cry, your beauty is way beautiful than cinderellas’. 87. My peace, comfort and joy-inducer, I love you more than the colours – words can paint. 88. My shero, I trust you so much. That I can lean on you even when I am sick. 89. My dreams are to be happy and loved by you. As in, just you. 90. If life gives one the ample opportunity to fly, I will take us up into to highest skies even when I am weak, just to show you how I always want to see you smile. 91. You make me wonder if I really deserve your affection, most times. You are too wonderful. 92. Girl, my heart has carved out a cleft for you alone to be. 93. Let your days be showered with even undeserved merits. 94. I find it fulfilling to be your love, just like a sprinter feels when he touches the finishing line first. 95. I sometimes see me as the other main actor beside you in a love fairy tale. 96. You ignite my vigour and seriousness anytime I see your stunning pictures working out. 97. My angel, I feel like I am a king anytime I take a look at your face. 98. Even when you don’t say a word, I still see affection burning in your eyes. I Love you. 99. Heart drive, you are the wand that makes me beck without hesitation at the most ridiculous request you make. Lol. 100. “Follow your heart,” they say. I waited upon it and it showed me the path to you.